But will weak protections against human rights abuses undermine the treaty’s intent? Virtually all major commodities traded internationally—from bananas to oil to iPods—are regulated with strong and binding international agreements. Virtually all—but until recently, no treaty or internationally agreed-upon standards regulated the international trade of arms, worth an estimated $70 billion each year. In 2006, the UN world conference on small arms collapsed as the United States pulled out of the negotiations after blocking key components of an agreement, including restricting transfers to non-state actors, imposing controls on small arms ammunitions and regulating civilian arms possession. In July 2012, the UN returned to the issue, but participating countries again failed to come to agreement. The Final UN Conference on the Arms Trade Treaty (ATT), which convened in March, was likely to be the last chance for countries to reach an agreement to regulate the international trade in small arms and conventional weapons. And agree they did, albeit in a roundabout way, adopting the first-ever multilateral ATT. But what did it take, and will it work? The idea of a treaty regulating the arms trade first emerged in the 1990s from a group of Nobel Peace Laureates, including Mikhail Gorbachev, and Amnesty International, and was led by former President of Costa Rica Óscar Arias. 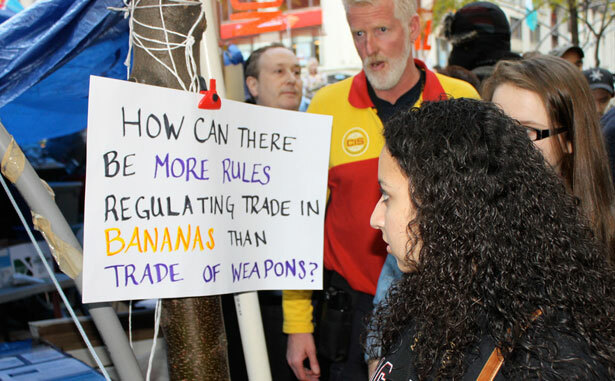 In 2003, the Control Arms Campaign, a worldwide network that includes non-governmental organizations, such as Amnesty International, Oxfam and Saferworld, and individuals, was launched. In 2006, the coalition delivered the “Million Faces” petition—the world’s largest photo petition, signed by one million people in support of arms control from over 160 countries—to Kofi Annan. But many countries on the UN Security Council had vested interests in preventing the adoption of such a treaty. Along with Germany, the five permanent members of the Security Council, known as the P5—China, France, Russia, the United Kingdom and the US—are the leading exporting countries for small arms, and the United States is the world’s largest arms manufacturer. According to Amnesty international, these countries—the “Big Six”—supply about three-quarters of the value of the world’s weapons. France transfers technology, mostly vehicles, to Sudan; Russia supplies the Syrian government with weapons; the United States sells ammunitions to Yemen; Chinese weapons have been found in countries under arms embargoes, such as the DRC and Darfur; British brass plate companies have supplied South Sudan with tanks, artillery and assault rifles. A report of the Stockholm International Peace Research Institute for 2010 shows that of the top ten largest weapons manufacturing companies, seven are American. Those companies, along with a British company’s American subsidiary, provide jobs for approximately 890,120 people. African and Latin American countries were the most fervent proponents of the treaty, while several countries, including Egypt, Indonesia, Ecuador and India, believed that it favored the largest arms exporters and promoted an imbalanced relationship between importers and exporters. Other countries, like Bolivia, Cuba and Nicaragua, argued that the human rights criteria were ill-defined and dependent on countries’ subjective interpretation. In the end, all of these countries abstained from the vote. During the final conference, countries failed to reach a consensus as Iran, North Korea and Syria vetoed the draft treaty. Anticipating this outcome, a December 2012 UN resolution ensured that if states failed to reach consensus during the conference, the General Assembly would take up the issue and act on the matter. Shortly after the countries failed to pass the treaty, the president of the conference, Peter Woolcott of Australia, decided to take the draft to the General Assembly for adoption by a two-thirds majority. On April 2, the treaty was adopted by an overwhelming majority: 154 states voted in favor of the twenty-eight-article treaty, twenty-three states abstained, and Iran, North Korea and Syria again vetoed. However, the adoption of the treaty does not mean that its provisions go into immediate effect. On June 3, the treaty will be opened to ratification at the General Assembly, after which each country must choose whether to ratify the treaty in order to implement it into national laws. The NRA has already pledged to fight to prevent the treaty from being ratified by the Senate. This legally binding treaty will regulate the international arms trade by establishing “the highest possible common international standards” regarding the import, export and transfer of conventional weapons. It also creates binding obligations for governments to assess the risk of transferring arms, ammunitions or components to another country where these weapons could be used to commit genocide, crimes against humanity and war crimes. In addition, the Treaty establishes for the first time ever a link between gender-based violence and the international arms trade, as it prohibits states to sell weapons if there is risk of gender-based violence. There is an absolute prohibition of shipping weapons to a country that is under a UN arms embargo—which likely explains why North Korea, Iran and Syria vetoed the treaty. States are required to establish a national record-keeping system in order to track the trade in conventional arms, a provision that is meant to ensure that weapons are not illegally transferred to other armed groups. The treaty also sets up a “Conference of State Parties,” a forum for transparency and accountability regarding the implementation of the treaty, but does not require states to release their reports publicly. The scope of the treaty—endlessly debated at the UN—covers the seven major categories of conventional arms, as defined in the 1991 UN Register of Conventional Arms, as well as small arms and light weapons. NGOs say this definition is too narrow and, as Acheson pointed out, “definitions can be frozen to weapon systems that made sense more than two decades ago,” because the treaty does not explicitly allow for updates to its scope. “We did not get everything that we wanted,” stated Brian Wood, head of arms control and human rights at Amnesty International. This is especially true concerning ammunitions. African countries strongly supported full coverage of ammunitions, but a number of other countries opposed such language, including the United States, which claimed that tracking ammunitions would be too costly and not administratively feasible. The ammunition industry for small arms and light weapons is worth $4.3 billion and produces 12 billion bullets each year. As Roy Isbister from Saferworld pointed out, “Ammunition is literally the fuel of conflict.” A compromise was eventually reached—ammunitions, as well as parts and components of weapons are not fully included in the scope of the treaty, but states are responsible for establishing and maintaining a “national control system” to regulate their export. Beyond this, the treaty exempts military aid and defense cooperation—a provision strongly supported by India, a major arms importer that could use this to circumvent the treaty. While the treaty covers the sales of conventional weapons, it does not address all the other ways in which weapons can be transferred, such as gifts, loans, leases and aid. Once the treaty is ratified and implemented into national laws, its enforcement at the national level will depend on whether UN member states will put significant pressure on countries violating the treaty and on the role civil society will play in pressuring governments to enforce its provisions. Dr. Natalie J. Goldring, senior fellow at Georgetown University, argues that there is strong skepticism towards international mechanisms for enforcement. “We should set up a mechanism that is sufficiently transparent and has the civil society involved, so that we don’t have to trust governments,” says Goldring. The treaty specifies the creation of a “secretariat to assist States Parties in the effective implementation of this Treaty,” and international cooperation, especially at a regional basis, will be crucial in ensuring successful implementation. This will be particularly important for countries at war or facing political instability. How can a country such as Mali, for example, assess the number of weapons flowing in its territory, when war is raging in the country? It would be naïve to believe that this treaty will put an end to the arms trade. But it sets the foundation for future amendments and is a strong symbol to arms traders and human rights abusers all around the world. This treaty puts an end to their shameful impunity, but the battle to limit the impact of arms trading continues. The text of the ATT is available here. Read Catherine Defontaine’s interview with UN Development Program administrator Helen Clark. Catherine DefontaineCatherine Defontaine is a Spring 2013 Nation intern. She focuses on security and peace-related issues, as well as African and French politics. Her work has appeared in French magazines.